I have been sitting on this book review for a couple of weeks, then surgery stuff went down and my world just went loco (I'll write more about that in another post soon)... So I'm happy to say that things have finally calmed down enough for me to tell you about some wee felty worlds that aren't so centered around my own! The book review this time is on "Wee Felt Worlds: Sweet Little Scenes to Needle Felt" by Amanda Carestio. I'll tell you, so many cute things to make in this book, and from plenty of different artists with lots of different but all wonderful style. I already love Aimee Ray (you've got to have seen her work already, and if you haven't, you must), and was pleasantly surprised to see her contributing a little forest scene, complete with squirrel. Okay, now the book is filled with eye candy, but also really valuable tips for novice felters like me. The first few introductory pages that tell you about "the basics" of needle felting had me saying "Ohhhh, that's so smart!" at least once per page. I particularly appreciated the tips that tell you to use stuff around the house to make this art easier. Like using a little bamboo skewer to wrap felt around to make your tiny shapes, then sliding them off once they're formed. Now that I know this little gem, I won't be stabbing the heck out of myself when I need to make tiny shapes. Another tip that I loved was using pipe cleaners (or "chenille stems" if you're fancy) as a base so you can pose your figures once they're done. The picture above is of the pipecleaner skeleton before adding the felt outside. I chose to try out using this method from Heide Murray's cute cute Circus scene. There were instructions to make a Ringmaster Penguin, Strongman Lion, and Fire-Breathing Elephant, but I really wanted to make a fox, so I followed the armature method instructions to make the body and then went off to fox-town once it came to the details. Felting around pipecleaners is tricky business. You have to be really careful to not poke the wire, or your needle can break... It was tricky, but my fox ended up being oh-so pose-able with that pipecleaner skeleton. The book did a really great job of pointing out little tips and tricks on how to do things the right way. You can tell that the contributors actually have the experience and the illustrations of the techniques are SUPER. 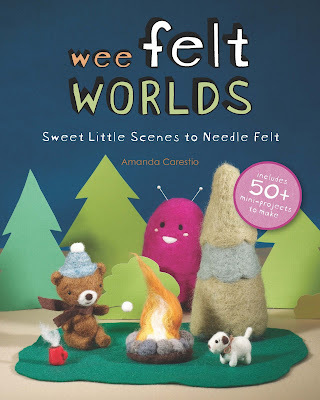 Overall, I really, really liked this "Wee Felt Worlds" book. I learned my needle felting basics from YouTube, but I was able to get a ton more specialized knowledge about technique from this book without having a search a ton. It was all right there :) I'm sure there's much more to felting than what's in this book alone, but dang, the possibilities! I learned how I can make moveable bodies, jointed arms and legs, blend colors, make wire armatures... So much. I recommend. I think this is one that I would have considered buying even if I just saw it at the store or if it popped up in my "You might like..." feed on Amazon. I mean, the title has the word "wee" in it. You know me... Anyway... I hope everybody has a great week. Thanks to Sterling Publishing for sending me a copy to review. This book looks great! I have been thinking of trying needle felting with Emma, as she loves to needle felt onto sweater scraps and such. I imagine she would love to make a needle felted movable horse. Oh, and can you maybe share the videos you used for learning to needle felt? This one will go on my amazon wish list. Your fox is so cute!